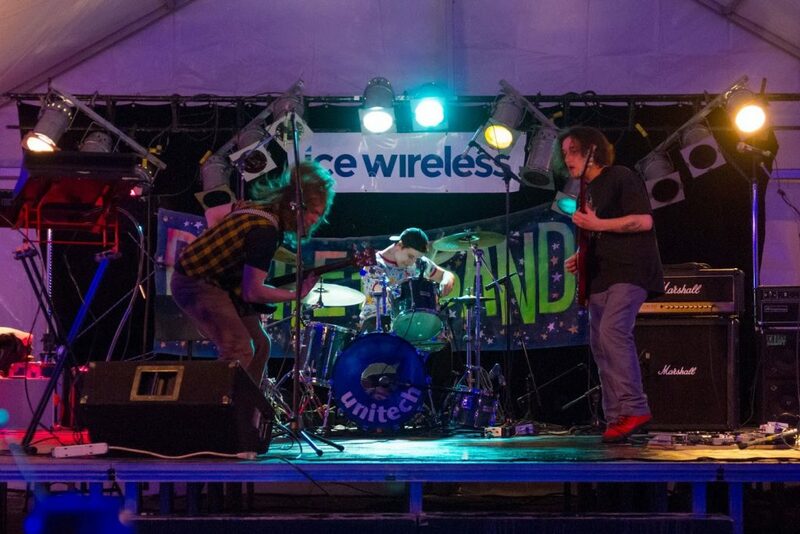 Last Thursday night, 8 performers under the age of 30 took to the Yukon Sourdough Rendezvous stage in the Ice Wireless Performance tent to compete in the 2018 BYTE Battle of the Bands and one thing is for sure, the judges had their work cut out for them!Â With sets by the Vanier Jazz Bands, Lucid Logic (ofÂ Free the Beat Foundation), Flaunt the Nothing,Â GFlow, Clairvoyant Felicities,Â Cymatic andÂ Antarticus, the audience was given a sample of everything from Jazz to Hip Hop to Rock n’ Roll! The Vanier Junior Jazz Band had the hard task of kicking off the evening but their positive energy, their onstage support of one another and their awesome solos got the audience cheering early on in the evening! 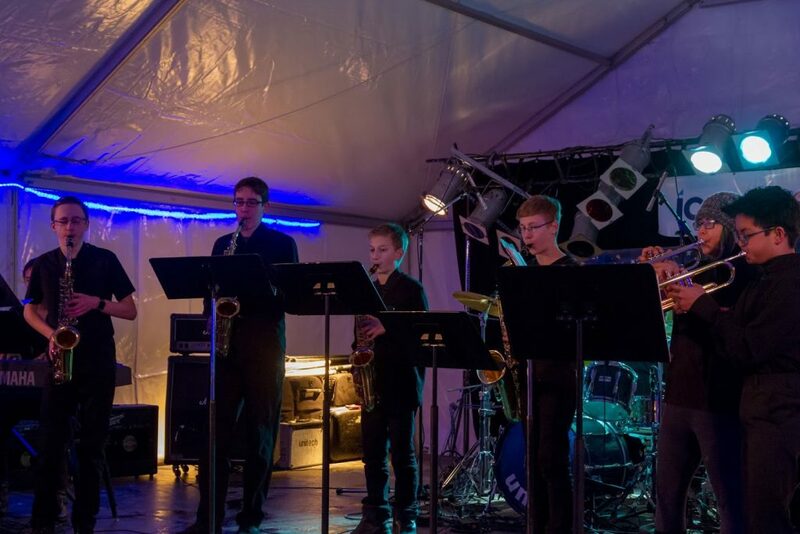 The Vanier Junior Jazz Band is undefeated (two years in a row) in the 16 and under category and we can’t wait to see them again next year! Keep your eyes out for them in What’s Up Yukon where they will be profiled as part of their first place prize! Â Â Â Â Â Â Â Â Â Â Â Â Â Â Â Â Â Â Â Â Â Â Â Â Â Â Â Â Â Â Â Â Â Â Â Â Â Â The Vanier Junior Jazz Band kickin’ off the night! Next we had a set by Daniel Mackenzie, aka Lucid Logic. Lucid Logic delivered some powerful, positive messages and wowed us with his many different voices! We’d heard some of Daniel’s sound before, but had no idea he could sing like that! Flaunt the Nothing, played next. This keyboard/drums duo fuses of jazz, blues and rock and roll for a unique sound. We overheard someone in the audience wonder out loud how just two guys could produce so much sound on just two instruments! Sticking with the jazz theme, the Vanier Senior Jazz Band took the stage next – these students were creative, cool and delivered some great solos to the crowd! Â Â Â Â Â Â Â Â Â Â Â Â Â Â Â Â Â Â Â Â Â Â Â Â Â Â Â Â Â Â Â Â Â Â Â Â Â Â Â Â Â Â Â Â Â Â Â Â Â Â Â Â Â Â Â Â Â Â Â Â Â Â Â Clairvoyant Felicities at the Ice Wireless Performance Tent. We changed gears from jazz and rock and roll to Gflow! Gflow is rapper, singer, songwriter and producer Gage Harvey. GFlow raps with unrelenting force and he quickly had the crowd chanting his name thanks to his raw emotion! He sang out his lyrics so quickly that we are still trying to figure out how he breathes! Next up, we had hop-hop/electronic producer Cymatic, aka Francis Thompson. It’s pretty amazing to watch Cymatic as he jumps back and forth from his keyboard to the mic in this one-man show. His energy and talent earned him the 3rd place prize! Last but not least, Antarticus closed out the show. Made up of Battle of the Bands veterans, Addam Parsons, Dustin Parsons and Mack Smith, Antarticus fuses old school vibes (think Motorhead and Rush) with new school heavy to pump out a sound that is totally their own! Their energetic, loud and unique performance earned them the 1st place prize (thank you to Arts in the Park and CKRW for sponsoring the first place prize!) Keep an eye on these guys to find out where they are playing next (hint: check out Arts in the Park this summer) and stay tuned for their album release this summer as well! A HUGE THANK YOU to our amazing MC, Ulyss, who had one of the hardest jobs of the night! He did a great job introducing all the bands, thanking all our sponsors and keeping the show running smoothly! 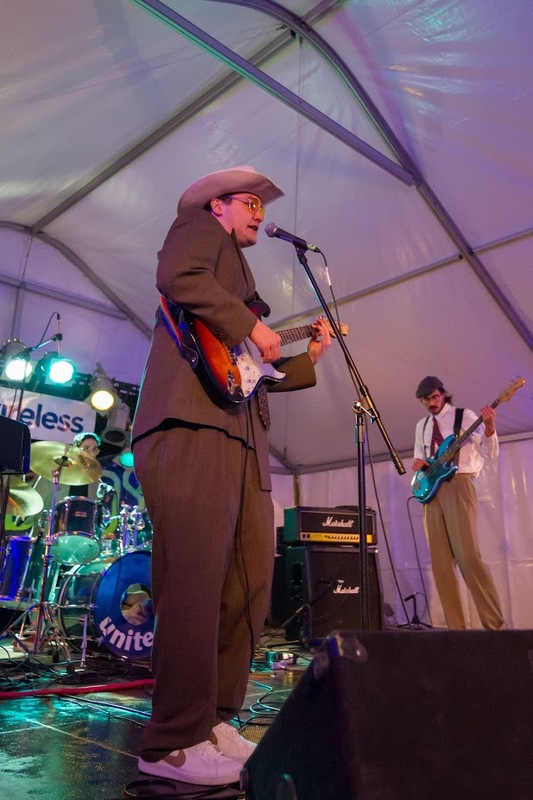 This event wouldn’t have been possible without support from Yukon Sourdough Rendezvous, Yukon Government, City of Whitehorse, Whitehorse Motors, Unitech, CKRW, Dawson City Music Festival, Music Yukon, What’s Up Yukon and Arts in the Park. A big shout out to our judges, Jona Barr, Aiden Tentrees, Zach Pellan, Michele Emslie and Kevin Jack, who also had the extremely tough job declaring a winner. Lastly, thank you to all our volunteers for helping with the concession stand, our audience for supporting local music and to the performers for putting on such a wicked show! Follow us onÂ Facebook,Â Twitter,Â andÂ InstagramÂ for details about next year’s Battle of the Bands and to learn more about our other upcoming events!